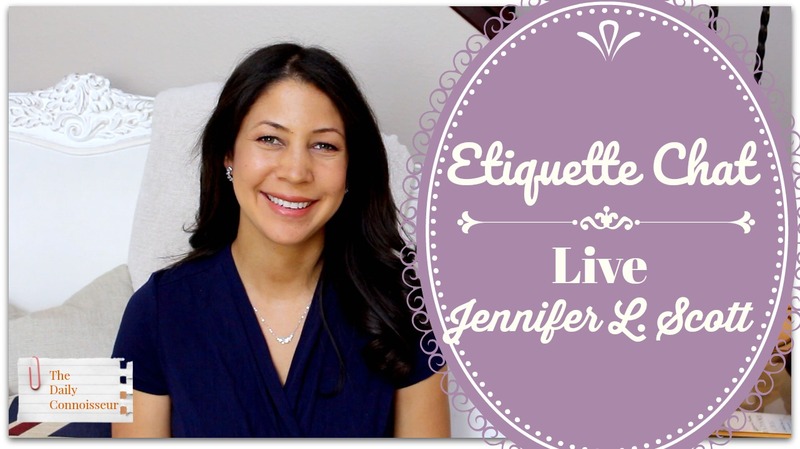 Thank you to everyone who joined me live last Saturday for our Etiquette Chat. I had so much fun discussing your pressing etiquette issues and the time just flew by. We talked for over an hour about a variety of modern etiquette questions. 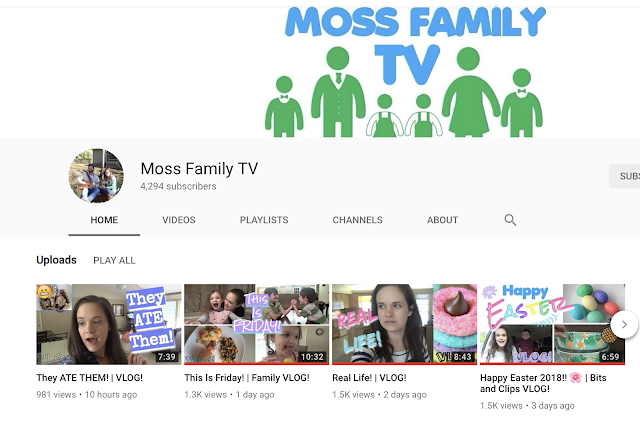 To never miss a live-stream, make sure you are subscribed to my YouTube channel. Click the "bell" for notifications and you will be emailed each time I upload a video, including when I go live. I also announce live-streams on social media. 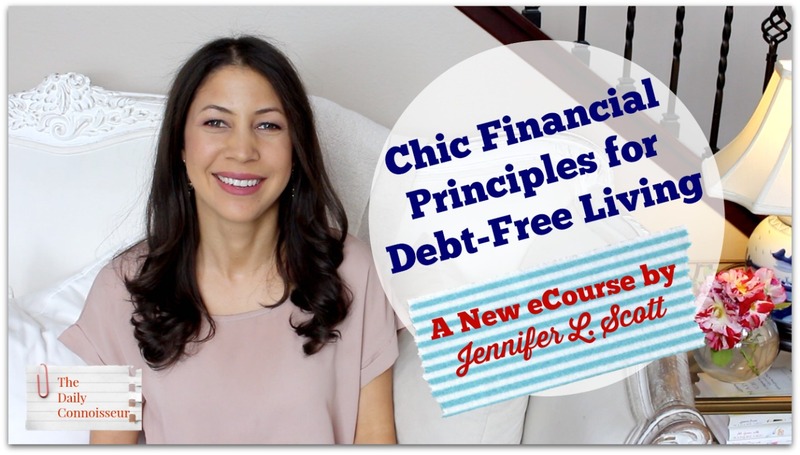 My new eCourse, Chic Financial Principles for Debt-Free Living, is getting wonderful feedback. Nora writes, "This course was amazing! I am debt-free, but you have inspired me to save more, love my home life, be happy with what I already have, etc. Thank you, Jennifer! Everything you produce is of such a high quality and truly gives so much value to your audience. I am looking forward to your next course! By the way, as soon as I finished the course, I watched it all the way through again! I wanted to really soak it all in!" Hi Nora, I'm so glad you enjoyed the course and congratulations on being debt-free! I am so happy for you and your family. Carey M. writes, "Sorry to miss the live chat, but I am really enjoying the video now. I agree with everything you said! I have a couple of really great pieces of advice about gossip that I have heard over the years. My mom always says, “If they gossip with you, they will gossip about you.” A teacher/mentor I had used to teach that gossip is having a stated opinion about something you don’t have responsibility for. She said, “If you don’t have responsibility for it, don’t have opinion on it.” And lastly, never say anything about someone that you wouldn’t say to their face. All of these have helped me avoid gossip over the years.﻿"
Hi Carey, your mother has very sound advice. Thank you for sharing her words of wisdom with us! Thank you for joining me today. I would love to hear your take on all of the etiquette topics discussed in this video. Please let me know what future live-stream topics you'd like to see on this channel. See you on Thursday for an exciting jewelry giveaway. I always appreciate wholesome book recommendation for young readers. 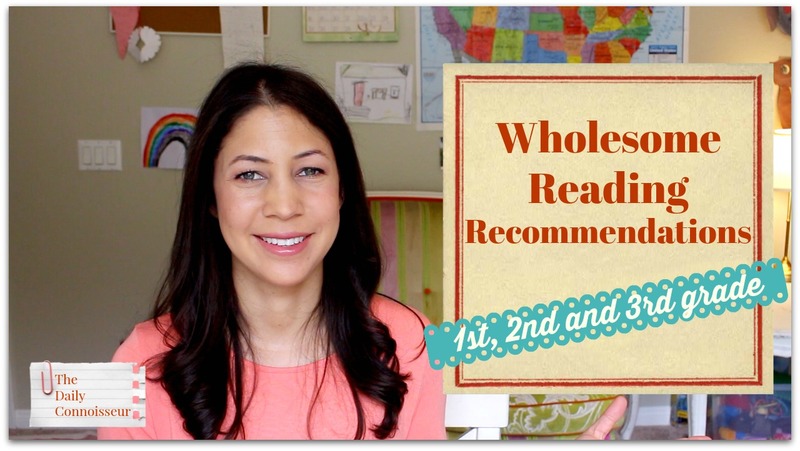 In today's post, I'm sharing my 7-year-old daughter's favorite books. She is an avid reader and likes to read for one to two hours every night before bed. Because of this, she burns through books very quickly. All of the series listed below are her favorites. I wanted to share them with you in case you have children, grandchildren or nieces and nephews who love to read. I would also appreciate any book recommendations you have for young readers (any age range). We can all benefit from each others' recommendations. *Updated* the next live-stream will be Saturday, April 28th at 9am PST. Bring your pressing etiquette questions. I look forward to seeing you there! Donna S writes, "Hi Jennifer, Your eCourse has inspired me to reach for a new level of saving! Thank you for such a lovely, positive class. I am always giving your books as gifts. Now, I'm going to start giving your books and recommending both your eCourses to brides-to-be! I'll tuck in an extra $10 for a book mark and encouragement to take your two classes. Thank you so much for the work you put in to this course - It's an amazing bargain... Continued blessings to you and I will look forward to new books and new classes." Hi Donna, I love your enthusiasm! Thank you for taking and recommending my course. It is so appreciated. Polish Your Poise with Madame Chic and a cup of tea. 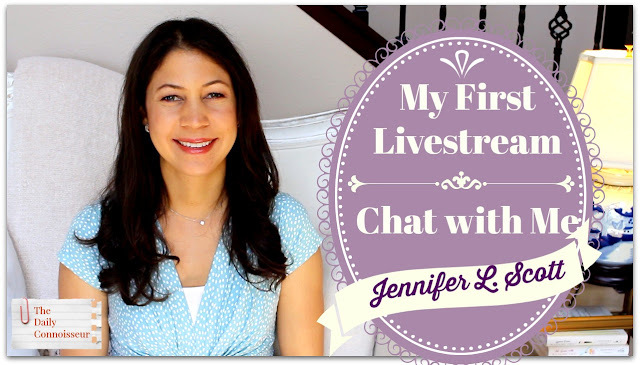 Regarding last week's livestream, Madeofmydreams writes, "Jennifer, your live chat was quite fun! It's lovely to see you in real time and know that you don't inauthentically "airbrush" your presentation of yourself for your other videos." Thank you! I plan to do another livestream within the next week. This one will discuss any etiquette questions that readers may have. I am not sure when my next live chat will be, but if you follow me on social media (links below), I will announce it then. Also, if you are subscribed to my YouTube channel and get notifications (by clicking the bell icon), you will be emailed the next time I do a livestream. I would love to hear your recommendations for young readers. What books do your children love to read? Please share your list so that we may all benefit from it. If you have any etiquette topics you'd like me to discuss in our upcoming livestream, please leave them here as well. See you soon! Thank you to everyone who participated in my first live-stream on the channel this past weekend. After one hour of very stressful technical difficulties, we were able to go live. I was so thankful that there were still many of you left to chat to! Thank you for sticking with me. I really enjoyed this live chat format because I was able to answer your questions in real time. I'd love to do more of these. 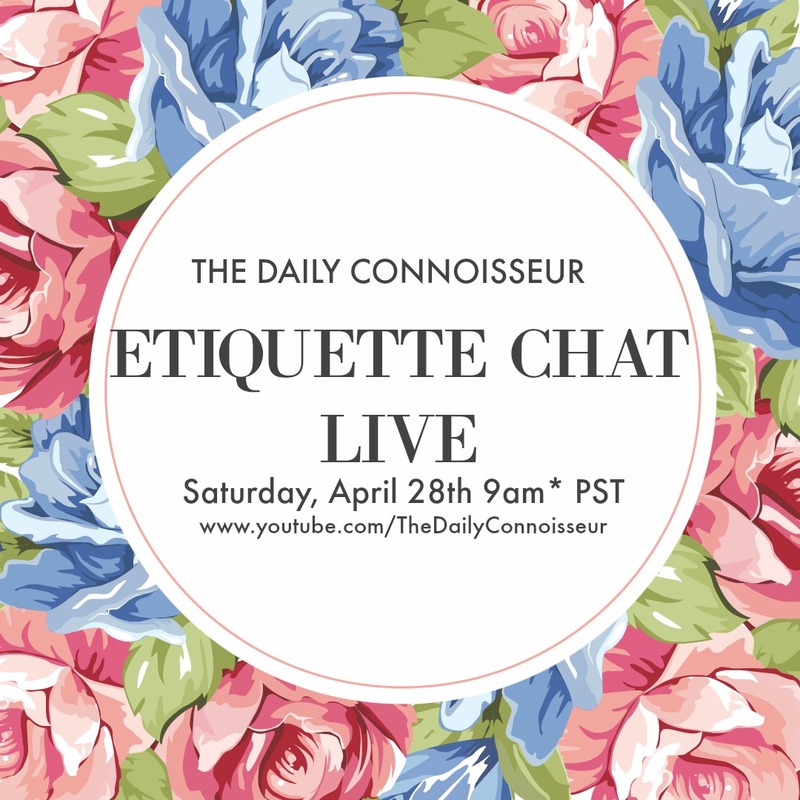 I would like to plan a live etiquette chat for next week. I'm not sure of the date and time, but I will announce it shortly. Get your real-life etiquette questions prepared and we will have fun discussing them. If you would like to submit your questions beforehand, you may leave them in the comment section below or on my social media accounts. If you ever miss a live chat, I will always post them on the blog and make them available to watch after it's over, as I did with this one. On the Debt-free course, Nora writes, "This course was amazing! I am debt-free, but you have inspired me to save more, love my home life, be happy with what I already have, etc. Thank you, Jennifer! Everything you produce is of such a high quality and truly gives so much value to your audience. I am looking forward to your next course!" Thank you so much, Nora! I really appreciate your encouragement and congratulations on being debt-free. Regarding last week's Trader Joe's Haul, Spicy Rosita writes, "Jennifer! I absolutely loved this video. I’ve always enjoyed your freezer meals but it was nice to see a new take on fresh meals. I’m a big fan of your channel and your Madame Chic books. I also took your financial course on Teachable. I am also a work-from-home mom and writer. I adored your self publishing story and just wanted to say you are a HUGE inspiration. While I’m at it I’ll also tell you that the 10 item wardrobe has revolutionized my life. I wish I would have snapped a pic of today’s outfit. I got so many compliments yet all I did was accessorize an old pair of jeans and a T-shirt with a cardigan, beautiful scarf and chunky heels. All thanks to your great advice! God bless you and your growing family!" Spicy Rosita, what a testimony! Thank you! I love hearing the exciting changes going on in your life. Thank you for joining me today and I'll see you on Thursday! I would love to know your thoughts about the topics discussed in this video. Please leave your comments below along with your etiquette chat requests. Your comment could be chosen as comment of the week on The Daily Connoisseur. I love seeing what other people buy at the grocery store, don't you? Today, I'm sharing my first grocery haul with you. I went to Trader Joe's and purchased a few of my favorites. I also show you what I make: roast salmon, red split lentils, butternut squash, and salad. In a pan over medium heat, sauté the onion in the olive oil for a few minutes. Add the dry lentils and seasoning and cook for one minute. Add the broth and bring to a boil. Reduce heat to medium low and cover with a lid. Cook for 12-15 minutes, or until the lentils are soft. Add toppings such as chopped celery, chopped tomato (you can also include this in cooking), crumbled cheese, etc. Serve over brown rice. You can also add spinach when cooking. There are many variations. The manuscript for my new book is due tomorrow! I am finished with the first draft and excited to have some down time. I've been working on this project for months and there is a lot of love poured into it. I'm so excited for you to read CONNOISSEUR KIDS in the fall of 2019. Laura writes, "I so appreciate you and the financial e-course! I loved the encouragement and can do attitude!! I encourage everyone to take it, the quizzes at the end of each lecture were fun and helpful!!!" Attention writers: my writing teacher, Alan Watt, who runs the LA Writers' Lab, is starting his new donation-based 90-Day Novel tele-workshop in May. For all of the information, visit www.lawriterslab.com. His great class was what got me started in writing. It's a wonderful way to build your discipline as a writer. 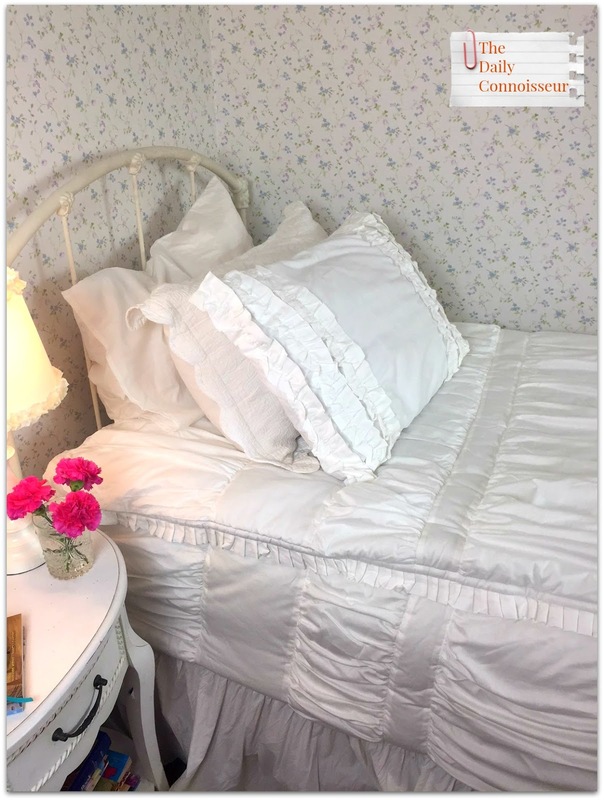 Regarding last week's wallpaper bedroom makeover, Emilia writes, "Jennifer, the wallpaper choices are very pretty, but what I find most beautiful is how 'real' this video feels. I love how the girls' bedrooms are not 'model bedrooms' with perfectly matching furniture and decoration items. I love that the they are having dominoes and the banana teething toy for tea, that the dolls are slightly big for their doll beds, that there is a multiplication table on the wall, that you portray life as it is, imperfectly perfect. Thank you for keeping it real and not massacring your readers with yet more bedrooms just like those on the pages of home decor magazines. I appreciate the liveness and love exuding from these rooms. Emilia"
Emilia, thank you so much. I really appreciated your comment. I get a lot of joy out of seeing my children's "play stations". Childhood play is so sweet and imaginative. Thank you for your kind comment. I hope you enjoyed today's video. Do you enjoy knowing what others buy at the grocery store? 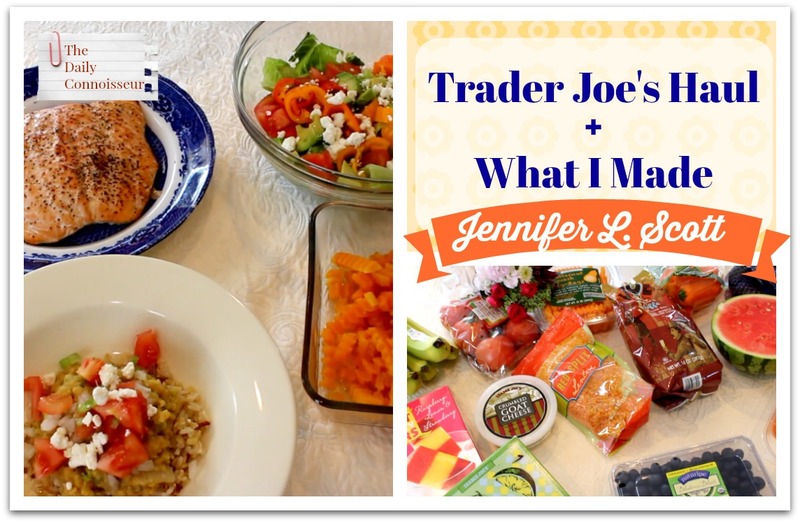 What do you like to get at Trader Joe's? Do you have a good recipe for red lentils? Let us know and your comment could be chosen as comment of the week on the blog. It's time to go through my ten-item wardrobe from last season to decide what will stay and what will go. 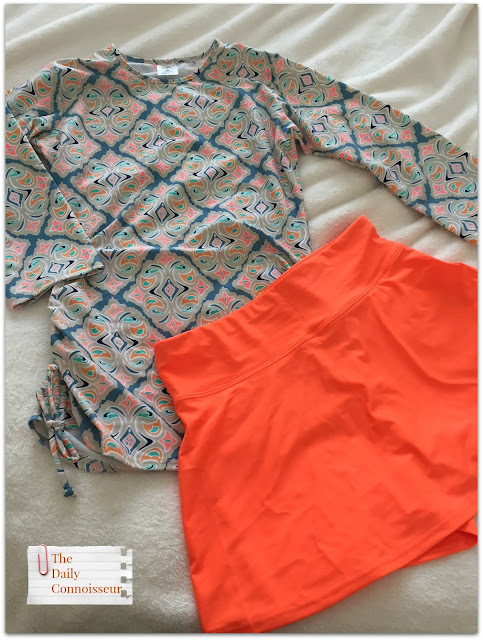 How did my budget wardrobe fare from zulily? This is an important step in the ten-item wardrobe process. At the end of every season, assess what worked for you and what didn't. Decide what will stay and what will go. Take notes if it helps. Store away your keepers and keep them until you use them again. Because I am pregnant again, I will store away my keepers and might not use them until the fall of 2019. That's OK. I will be in maternity/ nursing clothes this upcoming fall and winter and will draw from my existing ten-item maternity wardrobe along with a few new purchases for this season of life. I will go over my maternity ten-item wardrobe in a future video. I hope you enjoy the recap in today's video. Renee G writes, "Amazing ecourse, I just so happened to listen to the lessons on vacation in Hawaii." Hi Renee, Hawaii sounds amazing. Thank you for making my course a part of your trip! In the comments on my Debt-free course, Amanda writes, "Jennifer, I've been doing the ten-item wardrobe for just over 3 years and I love it! Can't say enough good things about it! I moved from warm weather to cold weather and it still worked great. During the winter I basically switched my sandals for boots and tees for sweaters. I found the combo of 7 tops/ 3 bottoms to be the perfect formula for me personally. What I love about this is that everything I wear, I love! I'm so picky about what I approve to wear and I really found my best clothes cut, color and fabric. (A-line, v-neck, Cotton, bright color tops with dark bottoms) I can't tell you how lovely it has been. I feel more confident about each piece I wear and get more compliments. Every year my husband purchases a new bag for our anniversary and I use that everyday (sometimes I'll switch out the other 2 beautiful leather bags that I love) Because I'm not wondering "what am I going to wear?" I get ready faster, each piece of clothing is well cared for, washed, steamed etc. I also have been able to invest In a lovely watch and necklaces since I love V-neck tops so much. Please keep your ten-item videos coming, your Winter 2017 was my favorite so far!" Hi Amanda, I'm so excited that you have experienced first-hand the beauty of the ten-item wardrobe. Thank you for your great testimonial! I hope you enjoyed today's video. 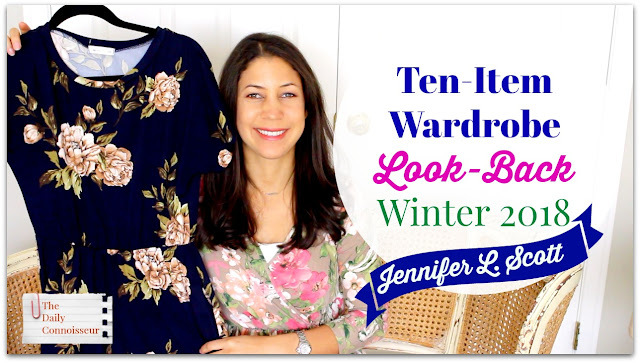 I would love to know how your ten-item wardrobe process is going. Have you assessed your items from last season? How did you do? Your comment could be chosen as comment of the week on the blog. See you soon! Don't you just love a good makeover? We have been wanting to put wallpaper in our daughters' bedrooms since we moved in. After budgeting for it, we finally started their room makeovers. The girls and I had so much fun choosing their wallpaper. We used Norwall again (the same brand we used in their bedroom of our former house). 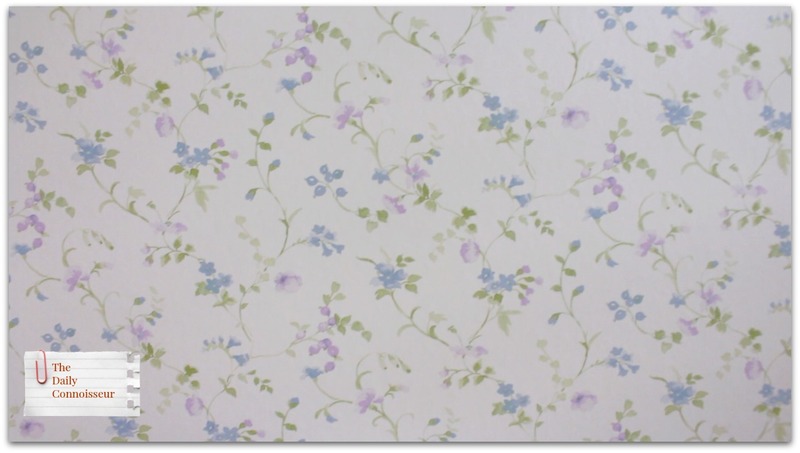 My older daughter chose a very similar wallpaper to the one she used to have, this beautiful floral. My younger daughter chose a complimentary paper with a floral stripe. 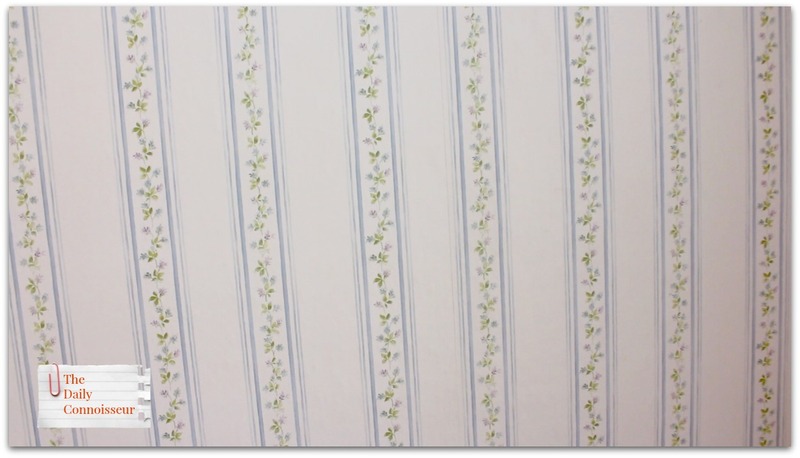 These are from the wallpaper book, "Petite Prints Wallpaper" (People's Choice basic small touches). In today's video, you'll see the before and after of their rooms. Before, their rooms had a putty color on the walls. It was very bland. We love that the wallpaper adds such a special touch. Another part of the makeover can be found in their bedding. 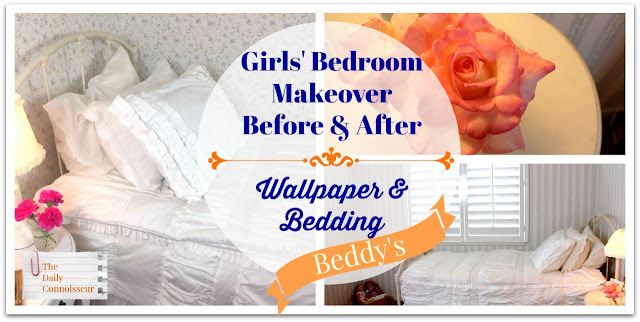 I found the company, Beddy's, a while ago and was always interested in their innovative bedding design. 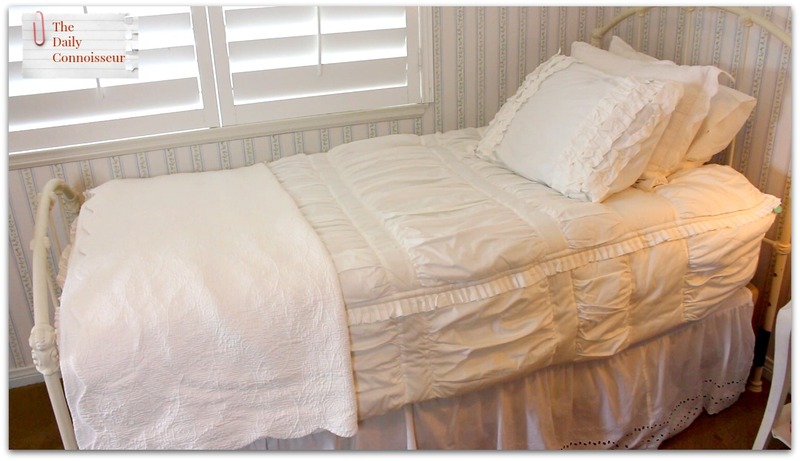 Beddy's makes handmade bedding for all size beds (twin to king) that has a unique zipper feature. Beddy's slips on your bed in one piece, just as a fitted sheet does. It zips together like a sleeping bag, making it so easy to make your bed in the morning and achieve a tailored look, especially for children. My daughters love sleeping bags and were so excited to try Beddy's in their own bed. They love to wake up in the morning and just zip up their beds. Voilà! A beautifully made bed. The Chic White Beddy's are featured on each of their beds. I love that their rooms always look neater and it's easier for me to wash their bedding now. I don't need to wrestle with duvet covers and fitted sheets, but put one whole piece in the washer. I hope you enjoy today's makeover video. For more content, take one of my popular eCourses: Create Your Own Ten-Item Wardrobe and Chic Financial Principles for Debt-Free Living. Laura D writes, "Thank you Jennifer! I am so glad that I took your course! I believe it was an answer to my prayer..."
Thank you, Laura! I am so happy you loved the new eCourse. Regarding Monday's Beef Mince Pie video, Bibiane writes, "That looks delicious!!! 💕 Have you ever tried cinnamon rolls with the leftover dough. When we were small my mom used to give us the leftover pasty, we would roll it out and spread brown sugar and cinnamon and roll it up then cut slices like cinnamon buns, we still enjoy doing these!😍💐﻿"
Hi Bibiane, thank you for the great idea. My daughters love to play with the dough and mini-cinnamon rolls are a great idea! I hope you enjoyed today's makeover. I would love to know... do you love wallpaper? Do you have it in your home? What's your interior design style? How do you decorate your daughter's rooms? Let me know and your comment could be chosen as comment of the week on The Daily Connoisseur. 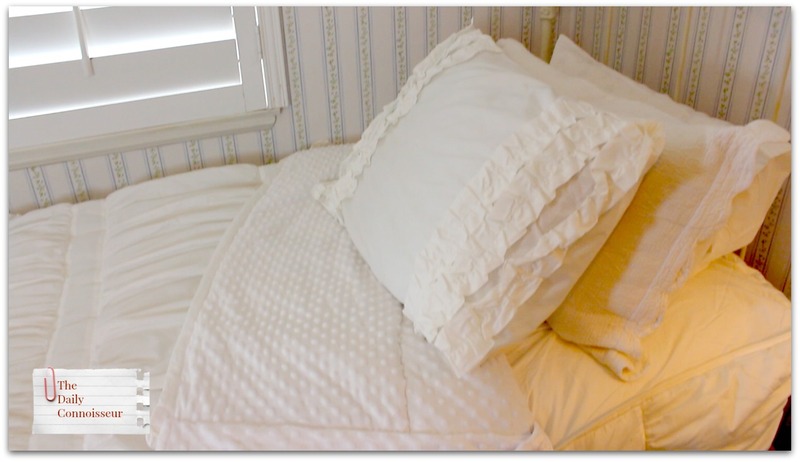 FTC: Beddy's were sent by the company to review. This is not a sponsored post. All opinions are my own. This post does not contain affiliate links. 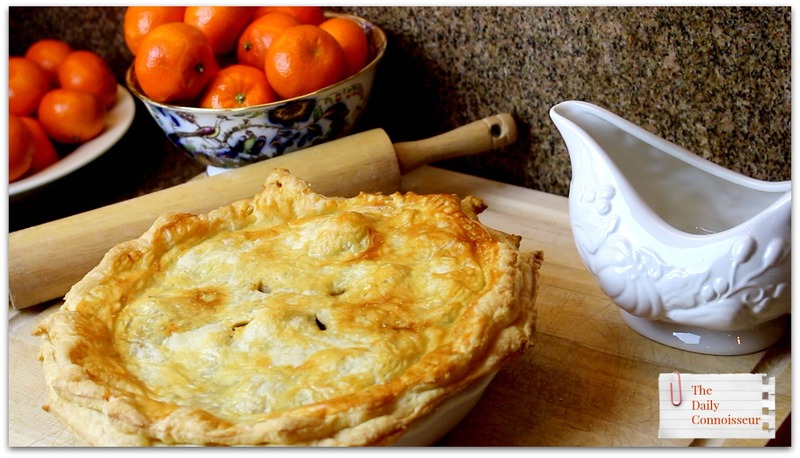 Today, I'm sharing one of my husband's favorite meat pie recipes: beef mince pie. This is a hearty and delicious dish. It's really easy to make and can have many variations. Preheat the oven to 350 degrees F. Brown ground beef in a pan with chopped onion and oil. Drain. Add to the pain the flour and bouillon and cook for one minute. Add the stewed tomatoes, peas, carrots and potatoes. Make sure your veggies are already cooked before adding them in, especially the potatoes. Canned potatoes actually work well in this recipe if you are in a pinch for time. Mix until the sauce is thickened. 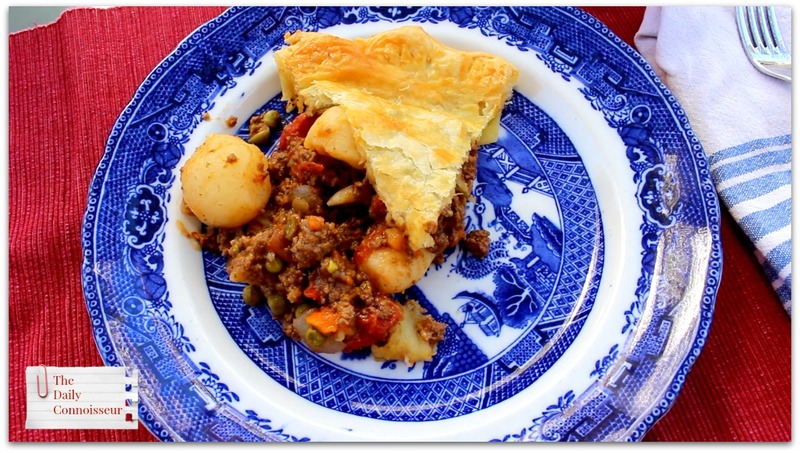 Add the beef mixture to a pie pan lined with puff pastry. Cover the top with the second sheet of puff pastry. Seal and trim the edges of the pie crust. Brush with egg white. Put slits in the top of the pie to vent. Bake for 25-30 minutes, or until the pastry is golden brown. Enjoy! **Please note: I forgot to add worcester sauce. That makes a wonderful addition. You could add 1Tbs. Melissa G writes, "Jennifer,thank you so much for your time, advice, and inspiration. I've gained a lot by taking this course and am even sad that it has ended. I know I will revisit lectures when I need a refresher. I also know I will come back and update on any new debt-free milestones I may reach in hopes that it will inspire others. God bless!" Hi Melissa, thank you so much! I am rooting for you and hope you do come back to update us on your progress. It is quite rare for me to comment on blogs I follow. However, I felt the need and desire to let you know how happy I am that I found you! My sister gave her nine bridesmaids your "Lessons From Madame Chic" book as part of a wedding gift almost four years ago. Sometime after, I started the book and didn't get past the first or second chapter. Not a reflection of your writing but one of my distracted self! And the book has been on display in my house since I married two years ago. 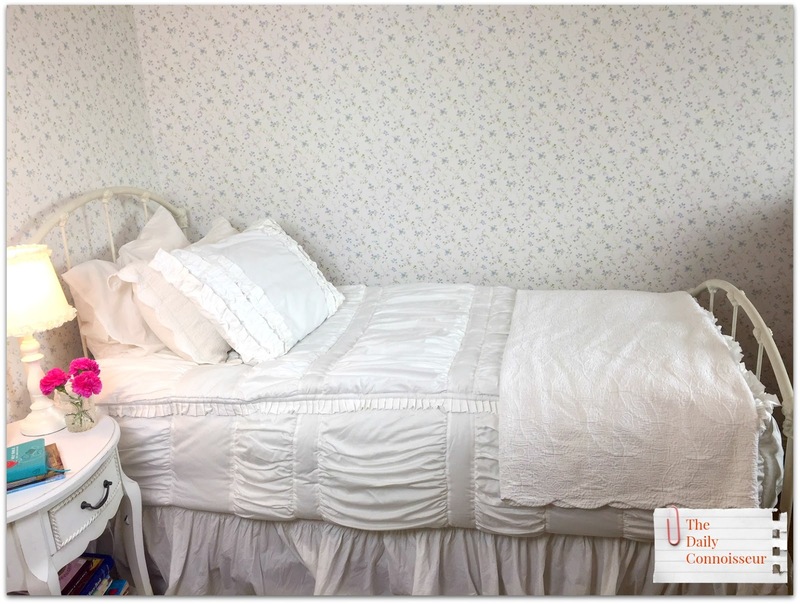 She recently bought the book forms herself, read it and decluttered her house. In her words she 'felt like a new woman"! Her husband is always asking her if she does something different if she learned it from you! After being sick and forced to stay in bed, I decided it was time to read the book. After starting it, I couldn't put it down. After finishing it within a couple of days, I bought the next book. Before finishing that book, I bought the next one because I wanted have it when I finished the current book! Sometime in between, I found your blog and have been soaking in all of your tutorials. Of course, buying both of your e-courses was imperative as I just couldn't/can't get enough of your content! It's been a little over a month and your inspiration has changed my home lifestyle! I love your "real"ness and just everything you do! I told my husband that I wish you had more books!! Anticipating the next! Congratulations on your fourth child which is also exciting as I'm expecting my first! Thank you, Jennifer for all of your hard work and love for home life! Nicole, you have such an amazing testimonial. Thank you so much for sharing your experience with the Madame Chic and The Daily Connoisseur. Welcome to the family! I hope you enjoy today's recipe. 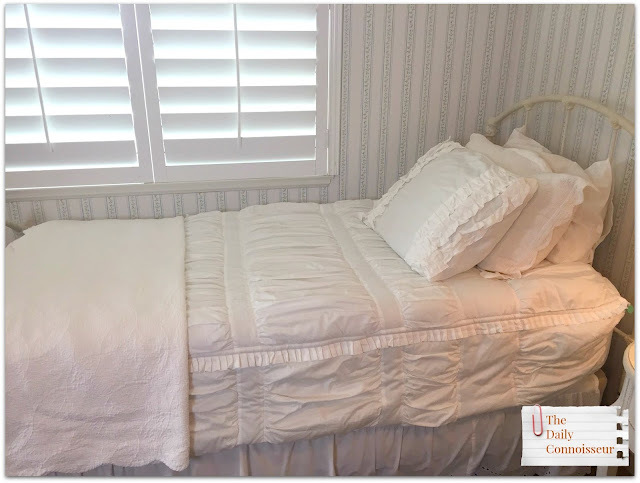 I'll see you back on Thursday for a special bedroom makeover video! Thank you so much to all of you for your warm congratulations following Monday's baby news announcement. We are so excited and I can't wait to share this journey with you again. Today, I have a long-overdue favorites video for you. My father has one of these and when I tried it out, I was hooked! 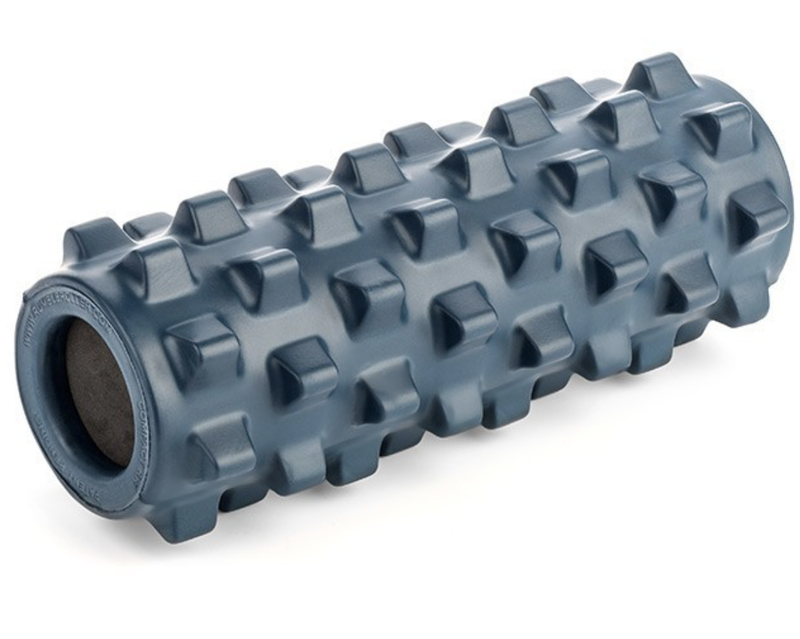 If you like regular massages you will love this roller. It gives you the feeling of a deep tissue massage any time you need one. I am linking both the compact size (the one I have) as well as the full size Rumble Roller. I just adore Jenny Williams of Carrot Top Paper Shop. She is an artist and creates artwork and paper gifts based on literary heroins. She recently sent me some updated customized stationery and I just adore it! I also love her canvas bags, bookmarks, and artwork. She also has a new line of paper dolls out. Visit her easy store Carrot Top Paper Shop to see it all. 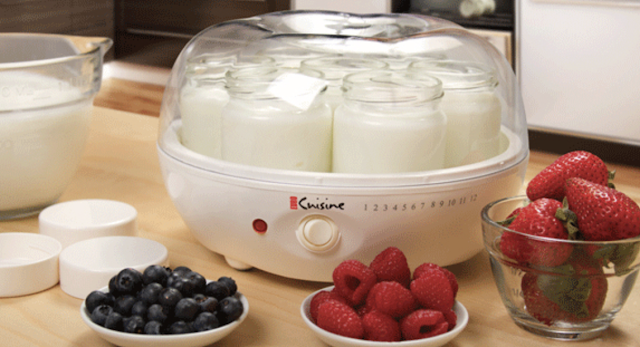 I have been making my own yogurt lately (I will do a dedicated video to show you how) and have been loving my Euro Cuisine Yogurt Maker. The yogurt turns out so good! It's creamy and delicious and the best part is I can control the ingredients. My favorite YouTube channel lately has been Moss Family TV. I just love the passion that Falon has for her family and for family life. She inspires me to continue to make my homelife a priority for the sake of my family. Subscribe to Falon's channel and show her some love from the Connoisseur community. 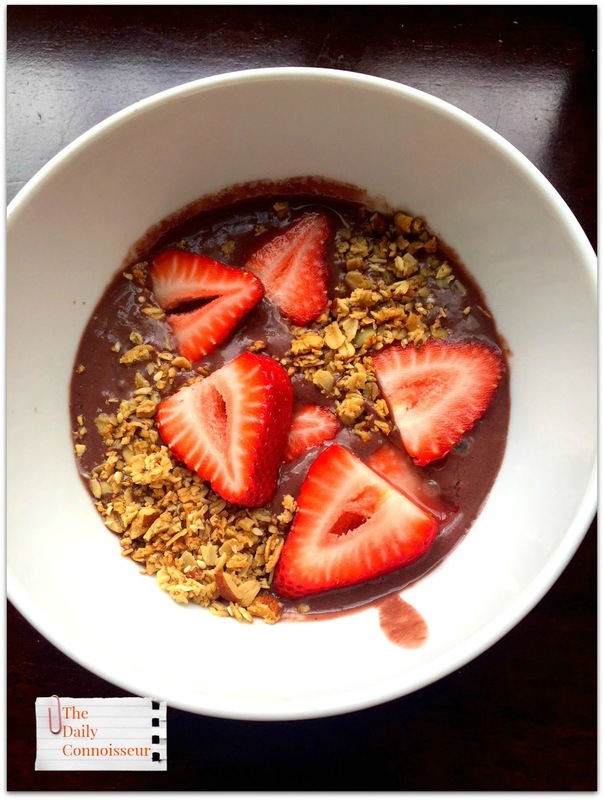 As the weather warms up and we head into spring/summer, I have been enjoying these açai bowls from Sambazon. I got my freezer pack at Costco. They are so delicious and you can customize the toppings. DeAnna B writes, "I'm a long time subscriber and just want to say how much I enjoyed this course! I really like the direction your channel is going in while maintaining your chic sensibility. Thank you for all the great work you do." Thank you so much, DeAnna, for your support over the years! Antonia Smith writes, "Congratulations! Children are a blessing! And strong homes are a need to society! ...beware random people in the grocery think that it is their business to make comments to pregnant women over 30😬﻿"
I hope you enjoyed today's video. I would love to hear which of these favorites is your favorite. Also, what are you loving lately? Let me know and your comment could be chosen as comment of the week on The Daily Connoisseur. FTC: This is not a sponsored post. 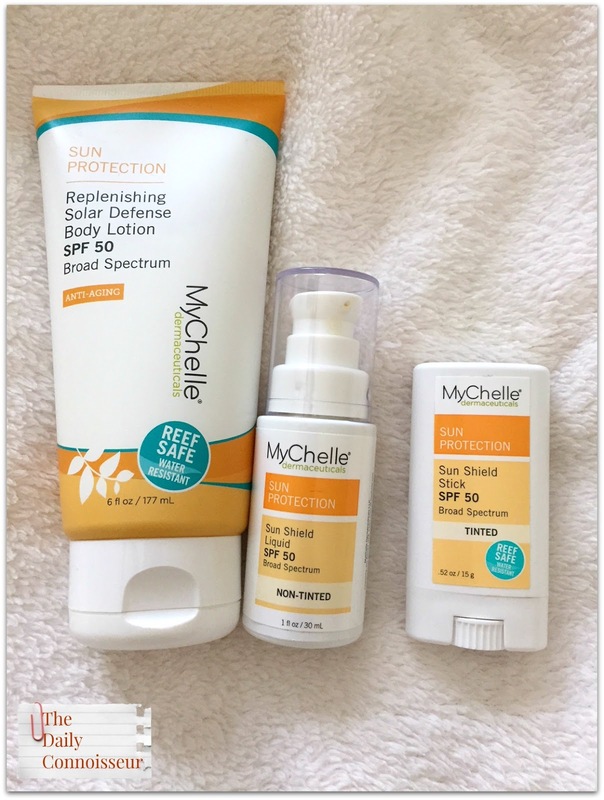 Modli Swimwear and MyChelle SPF was sent to me to review. All opinions are my own. This post may contain affiliate links.